Q1 2011 Online & Mobile Industry Trends - Berkery, Noyes & Co., LLC. 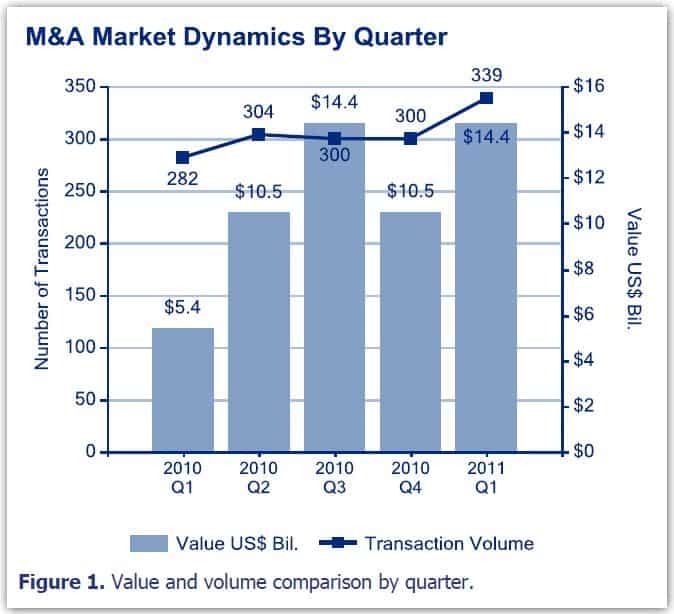 Q1 2011 transaction volume exceeded each quarter of 2010 in the Online & Mobile Industry, while aggregate transaction value rose 37 percent over Q4 2010, from $10.5 billion to $14.4 billion. The Online & Mobile Industry saw almost 1,200 transactions last year, by far the most transactions that Berkery Noyes has tracked, and yet the transaction volume has again risen, with Q1 2011 gaining 13 percent over Q4 . eBay acquired GSI Commerce Solutions, Inc. for $2.14 billion in the largest online transaction of Q1 2011. This was their second largest purchase, bested only by their 2005 purchase of Skype, Inc. for $2.6 billion, a property they sold for just over $2 billion in 2009. Both the E-Commerce and E-Content segments were well represented in the Top Ten Notable Transactions, with five and four transactions, respectively. 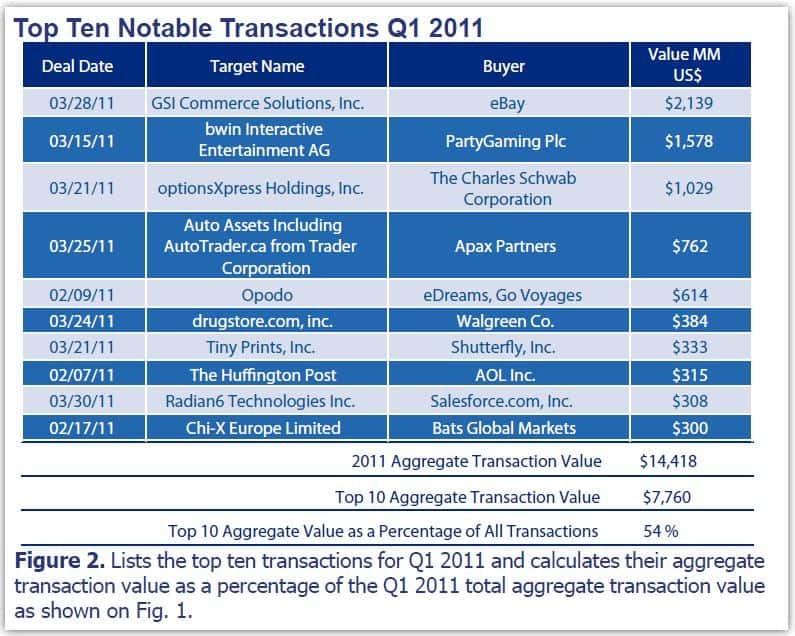 This prominence in the top 10 transactions is mirrored by the quarter gains seen in both segments, a 30 percent increase in E-Commerce transactions in Q1 2011 over Q4 2010. So too was there an increase in E-Content transactions, with a 44 percent gain in Q1 2011 over Q4 2010. This was bolstered by Aol, Inc., the most active acquirer in Q1 2011, making four transactions within the E-Content segment: About.me, Inc., Outside.in, The Huffington Post and GoViral. Q1 2011 also marks the return of the E-Content segment as the largest by transaction volume. 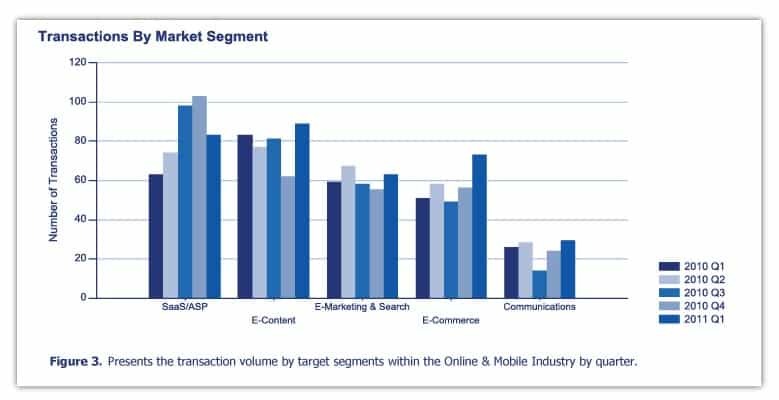 The past year had seen Saas/ASP and E-Content segments trade the lead in Online & Mobile Industry transactions, but E-Content has reclaimed the top spot that it lost in Q2 2010. The Communications segment was not without its own large transaction as Vocollect was purchased by Intermec, Inc. for $197 million, the largest Communications segment deal.